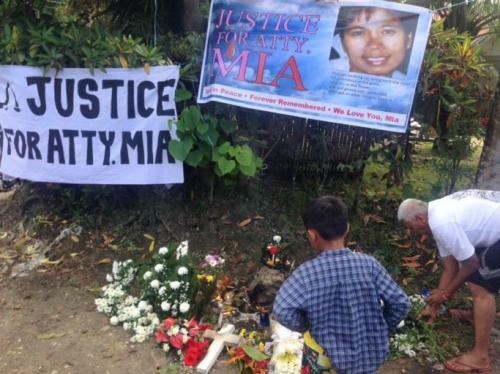 Environment and human rights advocates in the Philippines gathered Tuesday to honor their colleague Mia Mascariñas-Green, who was shot dead Feb. 15. Mascariñas-Green, a lawyer for the NGO Environmental Legal Assistance Center (ELAC) who also worked on civil and criminal cases, was ambushed while driving her three young children in Tagbilaran City, on Bohol Island in the Central Visayas region. The Philippines is one of the most dangerous countries in the world for environment activists. At least 100 environment and land defenders were killed between 2002 and 2015, according to data collected by Global Witness. According to local rights groups, 10 Filipino environment activists were killed in the seven months following the inauguration of President Rodrigo Duterte on June 30, 2016. Investigators believe Mascariñas-Green’s death was linked to her legal work on a property-dispute case in Panglao, a resort island off Bohol. Police have pointed to the opposing party in that case, Lloyd Lancer Gonzaga, as the alleged mastermind of her murder and raided Gonzaga’s property on Friday. Gonzaga and an alleged accomplice remain at large. Mascariñas-Green’s family and supporters recall her as a devoted advocate for the environment and for women’s and children’s rights. “From a young age, Mia always believed that everyone, young or old, rich or poor had rights and that ultimately the legal system would work for them,” her family said in a statement. According to her family, Mascariñas-Green had received death threats in the past as a result of her work, reflecting the extreme risks facing activists in the Philippines. “She said that getting a death threat was to some extent just part of the job of being a lawyer … But she never backed down from any situation, dutifully doing her work and faithfully following the creed of her profession as a lawyer,” they recalled. The murders of environment and other rights activists in the Philippines occur within a broader climate of impunity. According to Human Rights Watch, more than 7,000 Filipinos have been killed in a brutal anti-drug campaign launched during Duterte’s presidency. As of last month, HRW was not aware of any police officers being prosecuted for extrajudicial executions or other crimes related to the campaign. Under previous administrations, the country was also gained notoriety for un-punished killings of left-wing activists and journalists. This story was first published on website Mongabay. The the original article.